Security has always been a major concern for organizations implementing mobile strategies. However, healthcare providers have even more to worry about with the Health Insurance Portability and Accountability Act (HIPAA) looming over their heads. The move to mobile expands access to health information to more people and more devices, which creates new systems and processes that must be evaluated for HIPAA compliance. Keeping up with compliance doesn’t have to be such a headache. 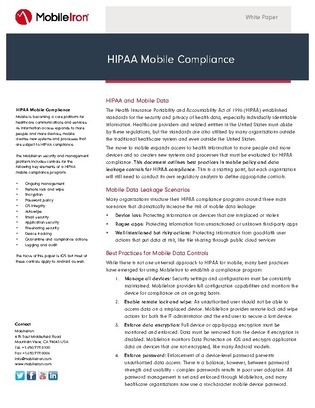 Access this white paper to learn the best practices for creating a HIPAA compliance program capable of handling device loss, rogue apps, risky user actions and more. Read more to discover how to get through HIPAA without any issues.